Creativity is a notoriously slippery concept. The place of creativity or creative practice in research is also open to different interpretations.¹ So, it shouldn’t have come as a surprise that the contributors to the Oral History Collective’s Show & Tell workshop ‘Exploring creativity and oral history in practice’ would present very different interpretations of this theme. But they did! The morning’s talks were by Catherine Hearne (CEO of Helix Arts) and Toby Lloyd (who is carrying out a practice-based PhD at Newcastle in partnership with Helix Arts). Catherine talked about past Helix Arts projects that had used archival oral history material to provoke new artwork in participatory art s projects. Toby works by occupying a space and painting signs on the walls which pose questions about people’s motivations for working and how they value their time. The use of spaces that are not conventional art spaces and the act of talking alongside people as he works, seems to create an environment that fosters conversation. Amongst the talks, and in discussions at a previous OHC drop-in meeting, there appears to be a fuzziness to the boundary between oral history interviews and social science research interviews. The work presented at the meeting sometimes sat on that boundary. 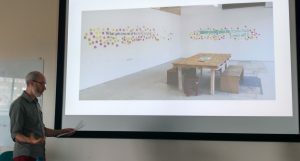 Nonetheless, the work presented by Catherine and Toby were about provocations – oral history provoking creativity and creative practice provoking oral histories. 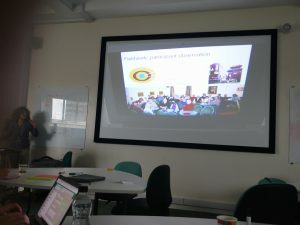 In the afternoon, Simona Palladino presented the work she had done for her (recently completed) PhD. Simona’s work is an exploration of the life experiences of older Italian migrants who have settled in the Newcastle area. Her work followed an ethnographic approach. However, she decided to work with colleagues in Culture Lab to create a film about this community. The film functions as a means of capturing aspects of these people’s experiences which were (perhaps) missing in a formal presentation of the study. It also seemed to operate as a gift to the participants, by valuing their lives and stories through the act of attending to them and sharing those stories with wider communities/audiences. In the final talk of the day, Melanie Stephenson talked about the work she has been doing for her PhD partly in collaboration with fellow PhD student Harriet Sutcliffe. Their work explores a period in the 1950s when new approaches to teaching were being explored in Newcastle University’s Fine Art department. Melanie’s work focuses on the impact that the Teaching Collection of paintings had on students’ experiences. They draw on archival materials and interviews with alumni from that period. The work is on-going but has already resulted in the production of an exhibition in the gallery drawing on this material. Melanie has a background in Fine Art and was offered the opportunity to display some of her own work in the Long Gallery at the Hatton. In Simona and Melanie’s work, the place of creative practice is quite different from the Helix Arts work. Simona used the creative, film-making practice to disseminate the work and to highlight modalities that are (perhaps) missing from the oral history material. Melanie’s work took the oral history as source material and transformed it through display. However, Melanie also used the opportunity to reflect on her history as an artist through the act of curating her work. The plans for the seminar and workshop were somewhat disturbed by the stormy weather on the preceding day and not all the planned talks could take place. Nonetheless, these talks indicated the potential breadth in this relationship between creative practice and oral history. There is, I’m sure, much more to uncover. This entry was posted in Conference Report, Oral History Collective, Seminar and tagged collaboration, creative practice, interviewing, memory, oral history, public history by Alison. Bookmark the permalink.